I happen to have rather a lot of men in my family, each fortunate to have disposable income. This can make gift giving rather tricky. Last year I crocheted hats, which were very successful, it may have been the fact is was snowing at the time of receiving them?! 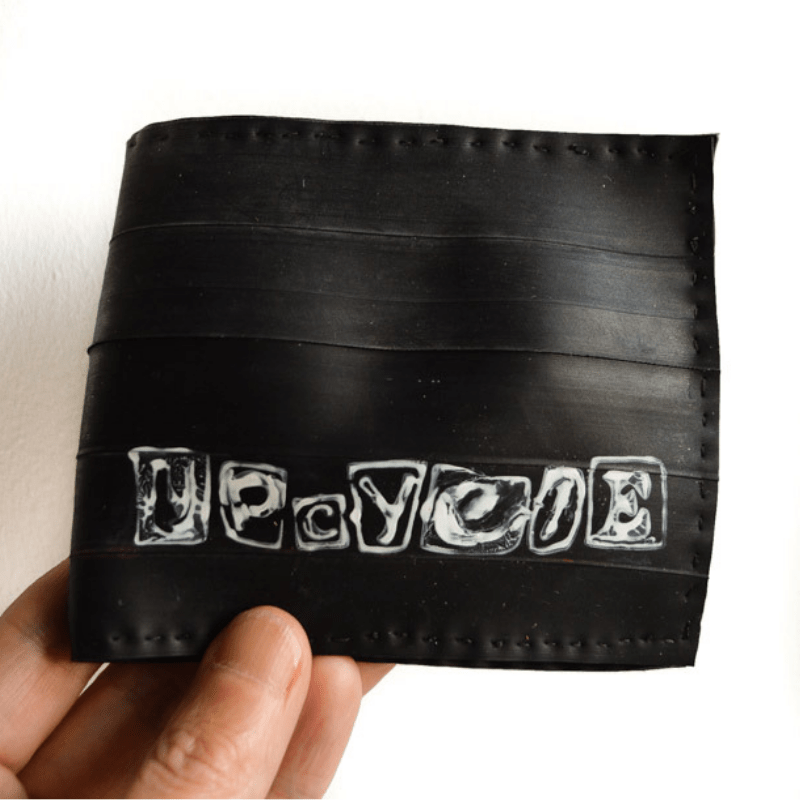 This year I am making a bicycle tyre DIY wallet. 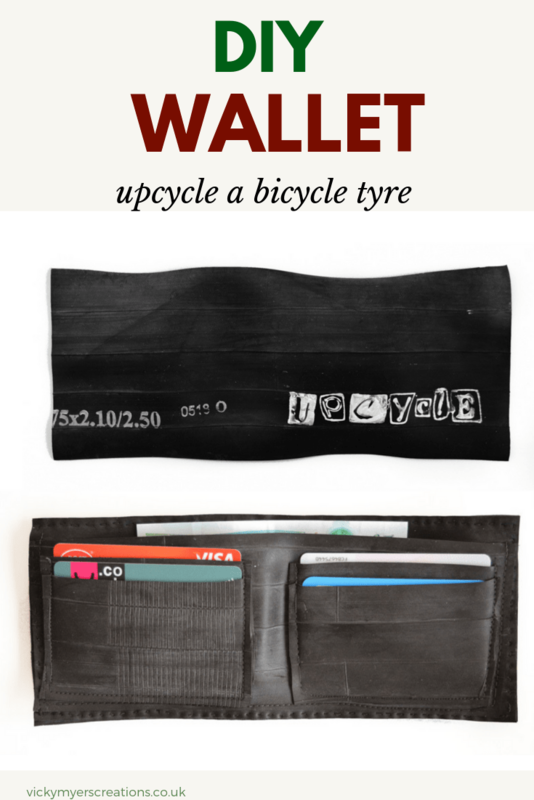 Before we start your sewing machine may not like sewing through a bicycle tyre. My top tip suggestions are to try a walking foot, or a teflon foot, tissue paper either side of the tyre, long and slow stitches/ Personally I swapped from my lightweight Janome to my trusted old Bernina. If need be you can easily hand stitch this project. 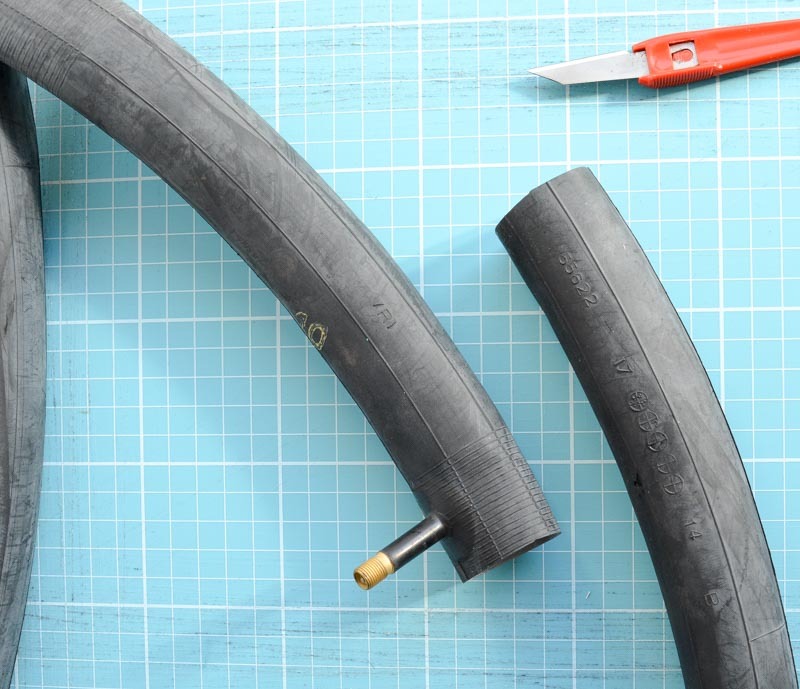 Start by roughly cutting your tyre up, into three 10″ lengths and five-inch lengths. You will notice powder from within the tyre. Rinse your tyre pieces and allow to dry. I suggest also washing some of the remaining tyre so you can practice the tension on the sewing machine. My Janome machine was not a happy bunny despite buying a Teflon foot so I switched to my old Bernina, if need be you can hand stitch. 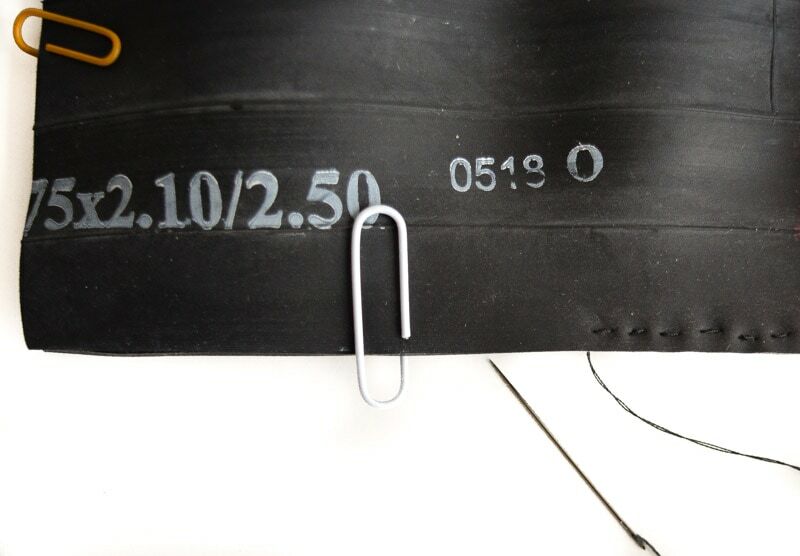 Check the stitching of your machine on your scrap piece of tyre, you may need to tighten the tension of the top thread. 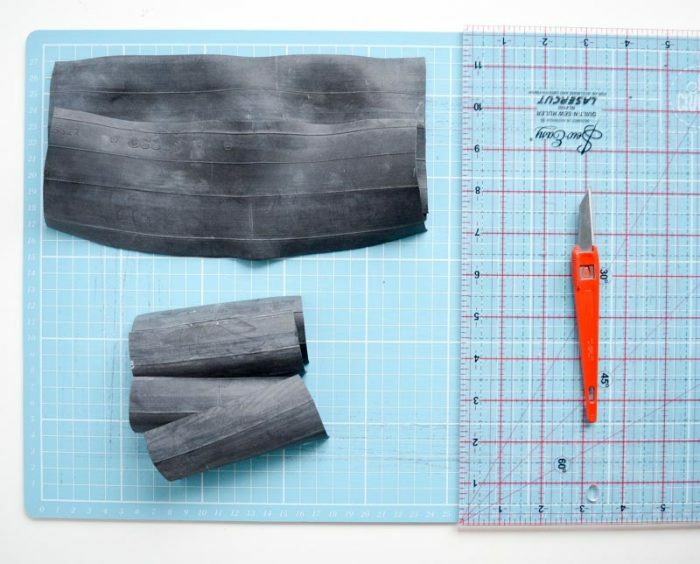 Next, you are going to sew the card pockets onto the piece of tyre 9 1/2 by 3 1/4. This is the piece which forms the pocket for bank notes. Place one of the card pocket pieces 1/4″ up from the bottom of the note pocket. Do not pin as this will create unwanted holes, you can hold in place with clover clip or paper clip. The rubber has a slight tendency to move under the machine. Stitch the bottom edge of the card pocket, as shown. Place the second pocket on, so the bottom edge aligns with the bottom edge of the note pocket. Stitch down from the right side edge, ensure you double back your stitching to have a good strong join at the top of the pocket. Along the base and back up the other side. Double check the width of the pocket with a card. Repeat for the second side of the wallet. Place the note pocket onto one of your two main pieces. If you wish to add a stencilled word to the front now is the time to do it. 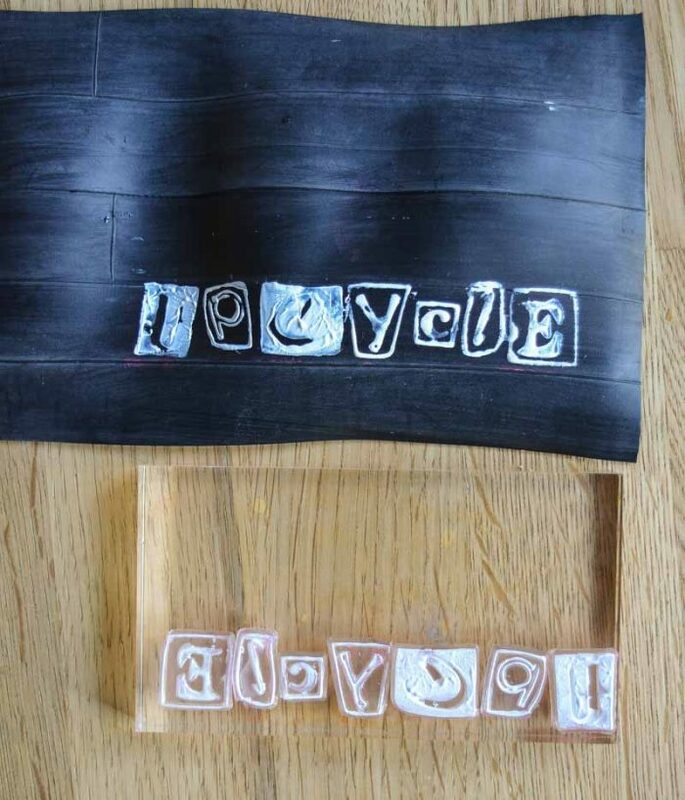 As the tyre is made of rubber I have used acrylic paint to print the word Upcycle onto the tyre. It is far from a perfect print, in fact, I did it twice as initially I used a water-based printing ink which did not adhere. Note the letters go onto the acrylic bock backwards! 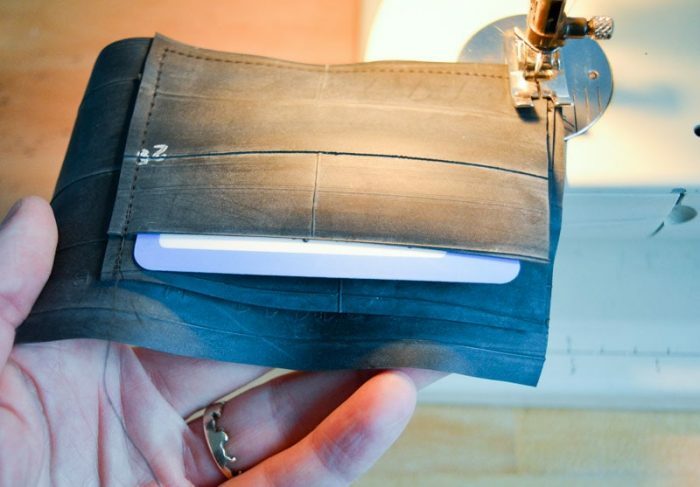 Place the front and inner of the wallet together and stitch all around. 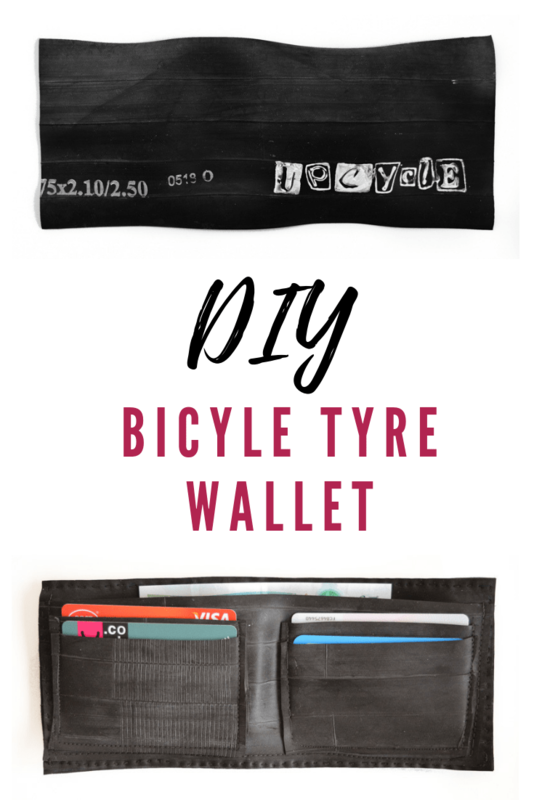 At this point, my sewing machine advised me it just wasn’t going to sew through so many layers of the tyre so I have handstitched to finish the wallet. If the idea of crochet hats appeal here’s my review of six free hat patterns, or how about a denim tablet case? What are you making the men in your life this year?? "Design your own necklace, DIY Statement Necklace"